In 2003 Tim Hicklin worked in the insurance industry and was looking for a more creative avenue in which to earn a living. Having graduated from Eastern Washington University in 1976 in Radio-Television, he has always had a passion for the industry of entertainment. in 2003 Tim had just purchased a small video camera for his own use and also acquired his first Macintosh computer from his brother. He began to entertain the thought of starting a video production company, and what better way than to start video taping weddings on the weekends while still holding down his day job. Tim states, “I placed a flyer that I made on my computer in a dress shop of a friend of mine, stating that a local start-up company needed to shoot a wedding for a demo reel.” Low and behold he got a call. 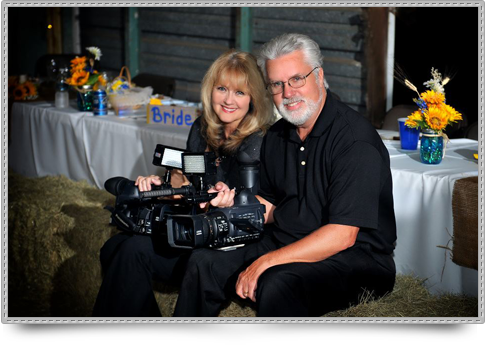 “Can you video tape my daughters wedding?” Now I had a prospect and now I had to shoot a wedding. But the problem was, this was something I had never done before, hadn’t talked to anyone about how to, didn’t read any articles on how to and didn’t know anyone to talk to about this new venture. Tim Is now, and has been since 2006, full time shooting weddings and other video projects. Patty no longer carries a camera, but she had an integral part in the start and building of Storybook Weddings, and she still helps Tim with the editing, giving a perspective of a new set of eyes before the final product goes out. Since then many other video projects have come their way and they continue to stretch their creative abilities in other video projects.